began in June 2015 to meet the needs of individuals that require conflict-free Care Coordination. The culture of Quintessence Planning and Care Coordination is built upon person centered planning. Quintessence means the “most perfect or typical example of quality or class, the aspect of something regarded as the intrinsic and central constituent of its character” (Websters, 2016). The planning process is the most vital component of care coordination. Identifying the heart and soul of what brings a person joy and meaning is the focus of person-centered planning. 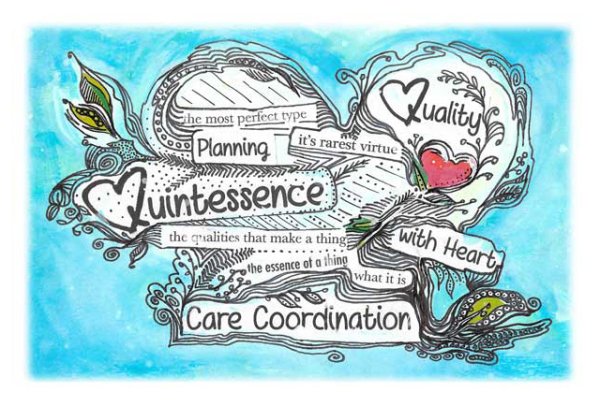 There is a wealth of experience at Quintessence Planning and Care Coordination that demonstrates this level of planning. Individuals with disabilities have been able to own their home, travel to other countries, obtain employment, find hidden talents through creative outlets and find true inclusion within the community. Quintessence Planning and Care Coordination believes that everyone should be treated with dignity and respect and have an opportunity to be the best version of themselves. The culture of Quintessence Planning and Care Coordination demonstrates the strength of the agency. Q: What types of waivers do you serve? & CCMC-Children with Complex Medical Conditions. ​​​​​ Q: What is the average caseload? A: Caseloads vary for each Care Coordinator, but will never exceed 25 individuals. Q: What regions of Alaska do you support? A: We cover the Kenai Peninsula, Anchorage, Matanuska Valley, and Kodiak. ​​​ Q: How can a family access Care Coordination? A: We believe that care coordination and planning occur outside of an office. Each Care Coordinator is available on their cell phone and will adjust their schedule to meet individual families needs.